Deadpool has faced his fair share of foes over the years, but probably few that are quite this ridiculous. Spoilers for this week's Deadpool #6 below! 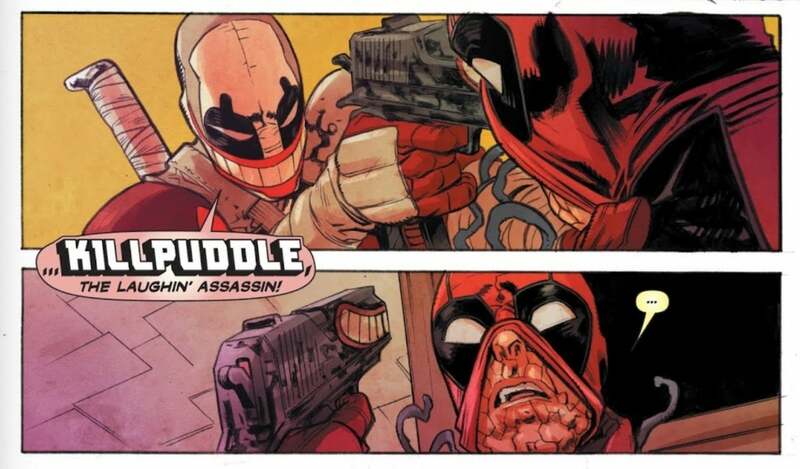 The issue sees Wade Wilson in a bit of a slump, which made him relatively unmotivated to take on his assassin duties. Wade spends the issue almost-wordlessly going about his day, only for things to be occasionally interrupted by some sort of masked assassin. The nameless assassin (who looks like a mix between the Joker and Fortnite's Wild Card skin) talks a pretty major game, revealing that they have bullets that neutralize mutant abilities. The only problem is that the assassin's attacks against Deadpool keep getting interrupted in increasingly ridiculous ways. Over the course of the issue, they get attacked by a giant monster that's fighting the Fantastic Four, beamed up into space by cyborgs, and sent into an alternate dimension by Doctor Strange. Ultimately, the villain confronts Deadpool while he's drinking, sadly, in a bar, holding a gun to his head and throwing him around. 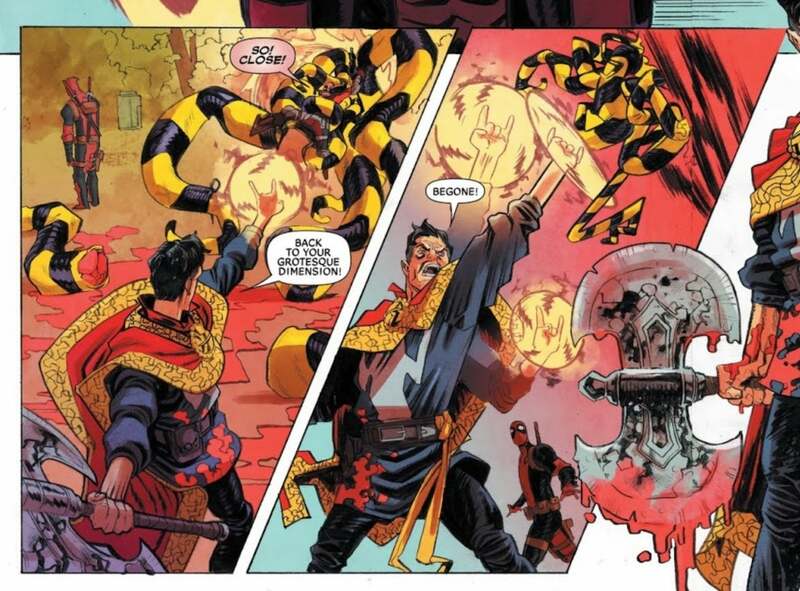 As they explain, Deadpool essentially stole their thunder, causing the wise-cracking assassin jobs to stop. But as the villain vowed, the world wouldn't soon forget Killpuddle, the Laughin' Assassin. This revelation quickly snaps Wade out of his funk, because he just genuinely can't handle how funny the name is. Wade soon leaves the bar, throwing a few grenades inside to make sure that Killpuddle dies in the process. 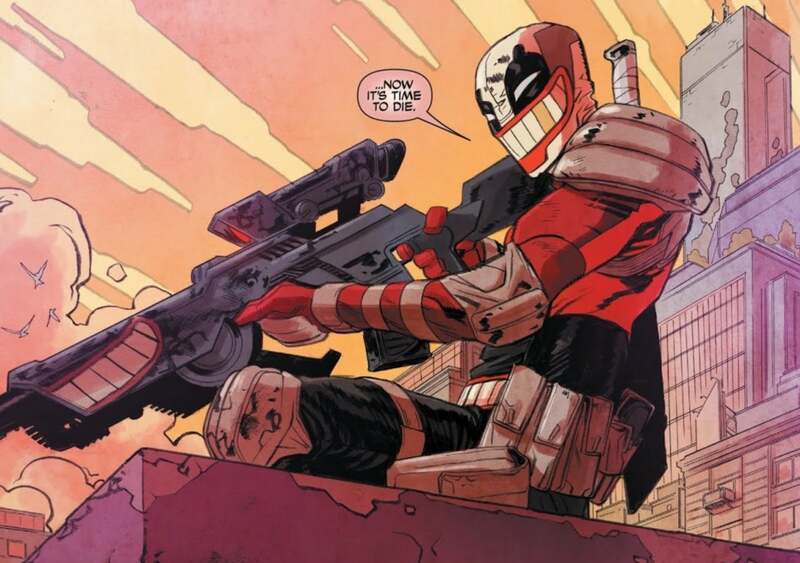 While Killpuddle might not have the largest impact on the Marvel Comics world, the notion of a sort of first-draft version of Deadpool is certainly amusing, especially judging by the character's pop culture impact today. And hey, considering the obscure Deadpool villains that have made their way into this run so far, maybe this won't be the last we've seen of Killpuddle. Deadpool #6 is in stores now.